Published in the South Kent Gazette, 2 July, 1980. The Wellington Dock, formerly known as the Pent, and in Elizabethan days, as “the Great Standing Water,“ has a history of its own. It is now surrounded by quays and thoroughfares as follows. Union Street and its quay, Cambridge Road, Slip Passage, Snargate Street and Commercial Quay, each of which embodies interesting local history. Union Street and Quay claim first notice, having been begun in the year 1580, when the dam was made across the Great Standing Water, by Mr Digges, under the direction of Queen Elizabeth’s Commission. That great dam, deriving its strength more from its bulk than the quality of its materials, formed a very wide wharf, where, during the 17th century, houses were built on each side of it. This thoroughfare, branching off at a right-angle from Snargate Street, was called, for want of a better name, “Snargate Street over the Water.“ Later, it was renamed Union Street, and the Union Hotel stood at the north-west corner, near the site long occupied by a weighbridge. In the 18th century, and the early part of the 19th, Union Street was one of the most important thoroughfares in Dover, having in it the Bank and the warehouses of Messrs Latham and Co. At the seaward end was the York Hotel, the Dover Castle Hotel, and the Cumberland Inn. Nearer the sea, on the site now occupied by the north-east comer of the tidal harbour, stood Amherst Battery, and the Ordnance Stores, which were removed in 1844. Here, also, were “the Old Buildings,“ destroyed by a great fire in the year 1808, which Old Buildings were originally the warehouses of Arnold Braerns, who farmed the harbour revenues in the time of Charles I, and were subsequently utilised by Isaac Minet, who founded a shipping, agency at Dover in the time of William III. The sole remnant of the Union Street buildings to survive until comparatively recent times was a large warehouse, which occupied the north side of the Granville Dock. Adjoining this were the offices of Messrs Latham and Co. Union Street long served as a link with the seafront, and the branch railway which passed along it, and the steel electrically-operated swing bridge which spans the waterway between the docks, formed a union with the railways and the Atlantic liner berths on the Prince of Wales Pier. Commercial Quay, which was the name of the thoroughfare margining the lower part of the west side of the Wellington Dock, dates from the year 1834. There was, previously, a road for foot passengers along the side of the Pent there, the earliest harbour building leases in that thoroughfare being dated 1813; while the Pentside chapel, closed in 1903, was built there in 1823. Commercial Quay was widened to a carriage road in 1834. The buildings, now demolished, which were put up there, were of a very mixed character. The Pentside had previously been occupied by the courts and outbuildings of the houses in Snargate Street which backed on to it. Until the late 1870s there were a few buildings on the harbour side at the south-west corner of the Wellington Dock, and a coal store and wharf, the property of the late Mr W. R. Mowll. The formation of this road, and the making of the dockyard, was the last work of Mr Fordham, harbour engineer, who retired in 1834. The making of Northampton Street, which has now almost completely disappeared, and Quay took place nearly twenty years later. Prior to 1852, the place at the back of Upper Snargate Street was called "Up the Pent,“ where there was an unformed road on the sloping side of the tidal stream, to the opening called Wellington Passage, leading to the back of the Snargate Street houses, which was a cut-throat place, devoid of lamplight, and reeking with all kinds of filth. In the year 1851, the Harbour Commissioners saw their way to remedying this nuisance, and, at the same time, adopting a scheme that would greatly improve their property by constructing valuable and commodious quays and a convenient approach road thereto. 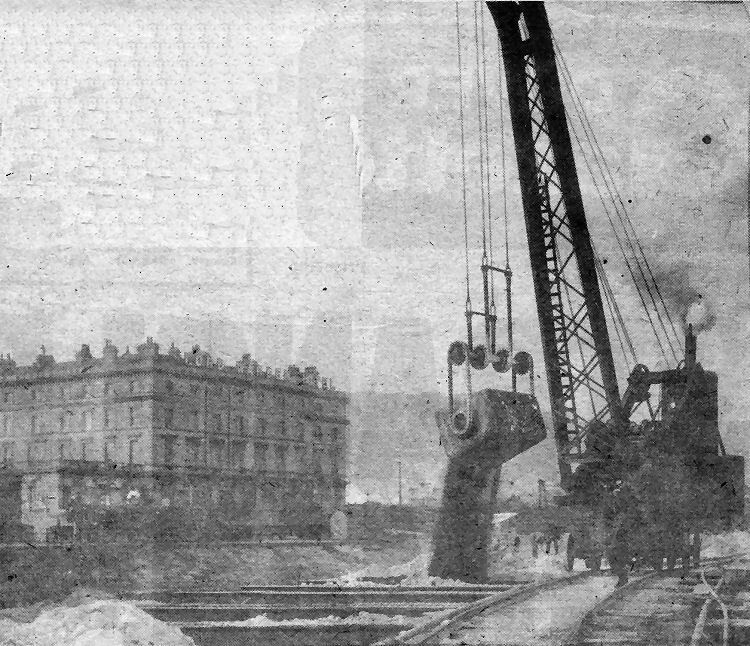 A giant steam operated crane at work on the widening of the Admiralty Pier in February 1911, using an early form of skip to tip chalk into the sea and form the base on which the Marine Station was built. 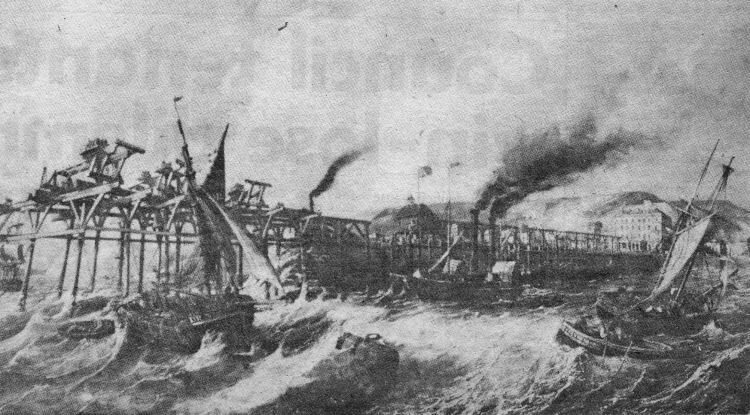 The picture above is of a stormy scene during construction of the Admiralty Pier. The original painting is owned by Dover Harbour Board.